Food is something we all cherish. It is not just something that we humans need to live but we Indians actually consider food as our love. There are thousands of dishes in our country and they all vary from place to place. Every state has a different kind of food culture. In all of that we all have our favourite dishes which we could eat as many times as possible. We Indians are actually known for our food. We like the masala and lots of spices in them. One of the main meals consist of Rice. It is our comfort food. When you can’t think of something else to cook, just cook rice. We know that rice will be fine for every occasion. Now, adding on to the loveliness of rice, pour a ladle full of rajma over it and you have your dinner ready. Adding on spoonfuls of curd to the holy mixture is even more heavenly. Every Indian surely has a memory associated with this dish. Be it their mother’s love or just something that reminds them of home. It is mostly served at lunch or dinner in most of the houses as we have a tradition of a heavy meal at dinner. It never mattered that we were gaining weight or something. Even when I was dieting, I never went for burgers or pizzas on my cheat days. This comfort food brings back so many memories for me too, that I have made throughout my life. 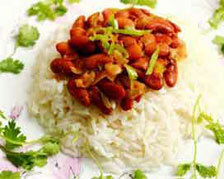 Rajma rice is loved by each and every person in my family, not one person can say no to it and obviously not me. Memories were not all we had that I would relate to this dish. I personally loved rice with anything, be it curry or chick peas but when you collaborate my two favourite dishes; rajma and rice, you get a bomb dish that will just make your taste buds go into a frenzy. The beauty of the dish is that every household in India has its own recipe. The basic cooking might be the same but every plate of it would be different. The difference is something to be appreciated. Some add green chillies to it, some like it all full of garlic and some prefer it just plain like it should be. Every homemaker tries to add her own innovation to it. My mother added lots of tomatoes to it and that tangy flavour with tons of red chilli made me go haywire. I am sure everyone loves their favourite dish which is why we abuse the groceries deals when we see our favourite groceries on discount but you can’t possibly compare them with this. This is the beauty of Indian food, you don’t just eat food, and you live with it. You live every second and every memory with it. That is how much we are attached to it and I take pride in Rajma rice being my favourite food.